Meet Gany, Cedar, and Quincy, three adorable pit bulls who recently passed the Canine Good Citizen (CGC) test at Salt Lake County Animal Services (SLCoAS). For these three rescued dogs, getting their diplomas was the icing on the cake for their hard work in the training classes over the last eight weeks. Salt Lake County Animal Services, in partnership with Best Friends Animal Society, is now offering low-cost CGC classes to dogs and people living in the community. Pit bulls adopted at the shelter can attend the class with their people at no charge. Dogs waiting for adoption at the shelter, as well as those dogs that are part of the shelter's foster program, are also benefiting from the classes by participating with volunteers. The goal of the program, spearheaded by progressive shelter director Shawni Larabee, is to adopt out more pit bulls and pit bull mixes, provide free spay and neuter for pit bulls residing within the shelter's jurisdiction, and have as many ambassador dogs in great foster and adoptive homes in the community. Larabee says, "Responsible dog ownership is much more than basic shelter and food. All dogs, regardless of breed, need training, socialization and daily interaction to be healthy, well adjusted members of our community." She adds, "The Canine Good Citizen certification is a great way to get started on the skills [people] and dogs need to be successful. For pit bulls, CGC certification is a perfect way to highlight this breed's desire to please and absolute trainability. 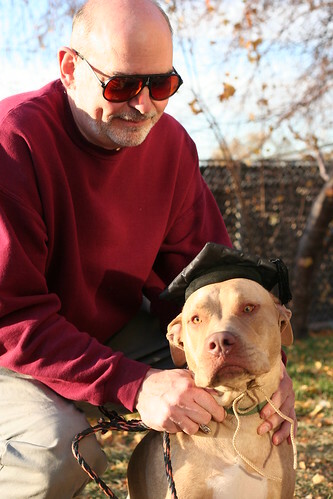 Good dogs are a reflection of good [people] and we are proud of our new pit bull CGC graduates and their [people]. Every dog deserves the chance to be a good citizen." CGC training and testing involves ten key points that build on basic obedience, although a dog doesn't need to have any prior training in order to take the class. The 10 points include: accepting a friendly stranger; sitting politely for petting, welcoming being groomed and examined, walking on a loose lead, walking through a crowd politely, sit and down on command and staying in place, coming when called, polite, non-reactive behavior around other dogs, confidence when faced with common distracting situations and lastly, the dog can be left with a trusted person and will maintain training and good manners. During the eight week program, dogs work on these skills and build on them weekly with shelter trainer Molly Janke. The test is administered by a CGC evaluator, one of the Best Friends' own Community Training Partners, and Skye Christensen Poitras, trainer to Vicktory dog Halle. The CGC program is an important one because it rewards dogs who have good manners at home and in the community and stresses responsible pet handling. The United States Senate and 35 state legislatures, have resolutions endorsing the Canine Good Citizen concept. The CGC exam is also a pre-requisite to therapy dog certification. Ganymede's (Gany) people, Lisa and Stan Thomas, adopted him from Furburbia about three years ago, and though he had never had formal obedience training, he was an CGC stand-out. The Thomases say that the CGC program is "great for any dog" and "very helpful for their socialization and comfort in different situations." All dogs can benefit immensely from a CGC training program, regardless of breed. Says Ed Fritz, campaign specialist for Pit Bulls: Saving America's Dog, "What I value in the Canine Good Citizen program is that not only does it strengthen the bond between a dog and her family, but that it gives [people] the ability and skill set to help that dog live in our society. This is a great program for any dog and a good starting place for those interested in contributing to their community by offering their dogs as canine therapy dogs and similar programs." To enroll in the Canine Good Citizen training program at SLCoAS, or to find out how to foster or adopt a dog through this program, please contact Michelle Martinez, Angela Pace, or Lidya Hardy at 801-559-1100. Adopt a dog from Best Friends or one of our Network partners.